Making your air clean, one duct at a time. You know that your carpets need to be cleaned; you can see the dust and dirt that accumulates over time. What you may not think about, though, are your air ducts. Dust and debris collect in your air ducts and if they are not cleaned, that dust and debris can be blown throughout your entire home. Gross right? There is a solution here at Steam Master Cleaning and Restoration, though. We provide high quality, affordable air duct cleaning in San Antonio. With our duct cleaning services, you can say goodbye to the constant accumulation of dust and grime in your home, and you can say hello to fresh indoor air. Indoor air quality is just as important as outdoor air, if not more so. While you may not be able to do anything about pollution and the environment, there is something you can do about the air quality in your home. With our air duct cleaning service, you can sit back and relax as we take care of all the cleaning for you. Air duct cleaning is just one of many of our residential cleaning services we provide. Our goal is to help you have a comfortable, clean home, from your floors to your air ducts to the furniture in between. Having your air ducts cleaned doesn’t just make sense, it is necessary to your health. 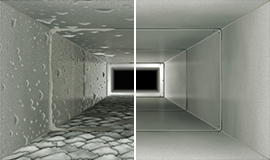 The fewer pollutants that there are in your air ducts, the less you have to dust and the easier it is to breathe. While not everything in your ducts is harmful, many people find that their allergies are reduced once we clean their system out. The more attention you give to your air ducts, the cleaner your home will be overall. Steam Master Cleaning and Restoration believes in going the extra mile for you because it is what you deserve. Whether you would like to schedule routine visits or you are just looking for a one-time service, we believe in forming a long-lasting relationship that is founded on trust. Talk to us today about scheduling air duct cleaning in San Antonio. We look forward to helping you keep a clean and comfortable living space.